The electoral process is pretty much broken in Colorado — and the Colorado Independent is valiantly fighting to be around to help fix it. That summarizes a panel discussion held Monday night, Nov. 16, as part of the Unitarian Universalist Church of Boulder’s Public Forum series. Susan Greene, a long-time Denver Post staffer and current editor of the Independent, noted that the four panelists present comprised, in fact, the entire full-time staff of the scrappy online site, which is struggling to keep investigative reporting alive in Colorado in the face of the near-demise of such efforts. Small, yes, but the Independent has been breaking strong investigative stories that other media have either picked up and run with — or simply plagiarized, Greene noted. Misconduct on the part of the Denver police has been one major focus of their reporting. In the run-up to the recent midterm election, the Independent’s reporters were shocked to encounter a new aloofness among candidates for Colorado’s top political posts, including Bob Beauprez in his run for governor, Cory Gardner in his unseating of Sen. Mark Udall, and also top Democrats as well. Greene had known and reported on Beauprez over many years while she was at the Post. But, this time around, once the friendly hug and the “how’s the family” banter were over, he flatly refused to answer her questions on issues. He instead curtly told her, “I don’t control my schedule.” In other words, the easy access that reporters had had to candidates in the past is no longer how the game is played. Candidates don’t want to risk upstaging the carefully crafted messages in their TV advertising. As for Gardner, his modus campaign operandi of “aggressively not answering questions” posed by reporters and TV interviewers alike was “as contemptuous as hell,” Greene observed. Colorado’s election results gave the lie to the notion that Republicans do well during midterm elections because of low voter turnout. The turnout in Colorado was in fact heavy, but Republicans took over a Senate seat and the State Senate anyway. “If you’re not depressed, you’re not paying attention,” observed Mike Littwin, Independent columnist (whose columns are republished by the Daily Camera under the Independent’s open-access copyright policy). Yes, there are funders — large, medium, small and crowdsourced funders — and work us underway to gain 501(c)(3) nonprofit status. But, as with dozens of new online media throughout the U.S., the business model for a viable — let alone prosperous — financial future seems murky. Monday’s forum was organized by the indefatigable Henry Kroll, himself a long-time media veteran and an activist in the national group Action Coalition for Media Education. As Boulder emerged from close to a week of deep-freeze weather, attendance was regrettably sparse at about 70 people. 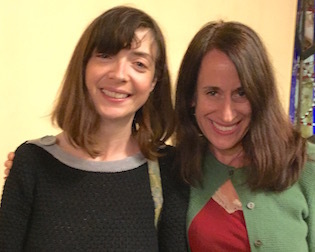 Too bad: the first-person encounter with Greene and her colleagues — Littwin, John Tomasic, managing editor, and Tessa Cheek, reporter — was inspiring and heartening as a glipse at what local journalism still perhaps can be. Another first-person encounter that’s always inspiring is with the evening’s moderator, KGNU news director Maeve Conran. I was personally cheered to learn in conversation with Greene after the event that she has been collaborating closely with a long-time idol of mine, James Ridgeway, a D.C.-based investigative reporter whose career has taken him ever leftward from The Wall Street Journal to positions at such publications as The New Republic, Ramparts and (recently) Mother Jones. At present, he and Greene are both aggressively reporting on the hideous scandal of how solitary confinement is run in the nation’s prisons, Ridgeway through his website Solitary Watch. Ridgeway also serves on an advisory board to the Independent. My first encounter with Ridgeway was back in the mid-1960s when he was the speaker at an annual banquet of the editorial cohort of The Daily Princetonian, myself included. Ridgeway, a former “Prince” chairman, showed up in a rumpled suit while we, the assembled lads, were in tuxedoes and smoking after-dinner cigars (hey, we’re talking Princeton in the mid-1960s, where pompous traditions died hard). Ridgeway proceeded to unload against a dozen types of corruption he espied at Princeton and beyond. Later, I did research for Ridgeway for two of his books, most notably a muckraking job on the unholy alliance between universities and business called The Closed Corporation. He also introduced me to his long-time collaborator Ralph Nader, for whom I then did some research on black lung disease among West Virginia coal miners. Ridgeway’s lifetime spent as one of America’s leading muckrakers has always served for me as a model of a road I chose not to go down, seeking instead an easier, softer way in blissed-out Boulder. Needless to say, the Independent’s efforts to keep investigative reporting alive in Colorado are wildly deserving of your financial support if you so see fit.